Why Choose Speed Gates to Protect Your Building? If you are looking for a way to increase security at the entrance of your building speed gates may be the solution you are looking for. These pedestrian access control systems are found in a variety of different buildings from stations and airports to government buildings and museums and come in a variety of designs and can often be customised to match the design of your building. The systems are designed to withstand high traffic areas and are both durable and reliable at effectively limiting unauthorized entry into your building. They do this through allowing some users direct access and limiting those without the required permissions, requiring them instead to be directed towards a reception desk or other part of your building. What are the Advantages of Speed Gates? Speed gate systems have a number of advantages. Some of these are detailed below. The first benefit of installing a speed gate system is, unsurprisingly, the increased security they provide to your premises. Speed gates will sit at a closed position until valid entry is granted either manually or through recognition systems such as ID cards, fobs or tickets. The gates can be programmed to automatically open to those who have the valid entry requirements, decreasing the chance for intruders to wander into your building. Speed lanes are also favourable as they have a fast throughout rate per minute. This is particularly important for buildings such as offices where there tends to be bursts of use at peak times. Because of speed gates' efficiency you may require less lanes and there will be less time wasted in queues compared to other access methods. Speed lanes come in a variety of designs and finishes. They are often chosen not only for their security but their sleek, less obtrusive design which is more likely to blend in with your reception. The units can be installed on their own or as multiples. Multiple lanes are created by adding an intermediate unit with a barrier on both sides - this helps to reduces cost and maximises the available space. Speed gates are easy to install as they often require no ground track. Work can be completed quickly to avoid disruption at busy, peak traffic times. The barriers in a speed gate will automatically retract in the event of a fire or emergency situation. Lastly, lanes can be installed in a variety of ways to make installation compliant with the UK Disabilities and Discrimination Act (DDA) as well as most international standards. URSA Gates have many years' experience in the installation of speed gates in a variety of different buildings and applications across the UK. Our professional team work with the best products and all of our installations include a 5 year warranty giving you peace of mind that repairs are covered in the unlikely case they occur. For more information or for a free quote for your building please contact us via our Contact Form or call us on 0800 566 8174. 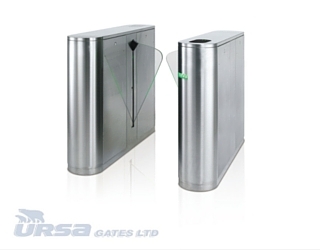 Alternatively you can look at a selection of our speed gate range here.